New York ought to be, at least once in the life of every artist a compulsory destiny. It attracted me unexpectedly, like a magnet. 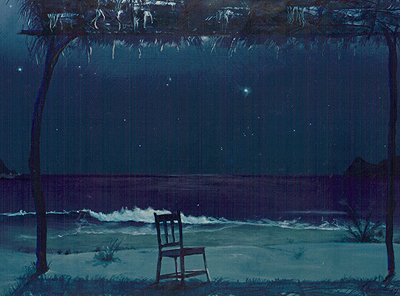 Still deep into Mexico’s 1994 economic crisis, and while I painted my version of Stary Night ( a chair and a palapa on the beach under the stars) I was listening to Richard & Wendy Musk’s “Present Dreams” album. I was captivated by this soft music. I played it over and over until I finished the painting. Feeling somehow grateful for the inspiration, as I came out of the right side of my brain to love the results, I looked for some contact information on the album’s cover. I sent these wonderful musicians a photograph of the painting I had produced with the help of their sounds. To my surprise, a few weeks later I received an invitation to visit them in New York! I rushed to accept the invitation. Quickly and without much money I did all preparations for the trip, in spite of this not being good moment for unexpected expenses. As I have mentioned before, art sales were totally depressed and I was struggling to pay my bills…but something inside moved me from the start. Anyway, I found myself flying to New York shortly afterward, with my portable easel and my photograph album as carry-ons. I still have the old easel: one of those classic French field models with three legs that pull out and a box that opens to hold the canvas. While staring at the clouds through the airplane’s window, a passenger near me asked what my box was, and I explained. Naturally, his next request was to see photographs of my paintings, so I handed him my album, which I always carry with me, just in case. Another passenger got interested and then one more: I relished my artistic ego. When one of them heard I was going to spend the night in New Canaan, he offered me a ride to the Melba Inn –the hotel Richard and Wendy suggested I stay at- and so it was that New York treated me well from the very begining, since my ride had an elegant limousine waiting to take him home. and none of them has an easy road to follow; what is magic is that there is always someone interested and ready to help. From this first visit evolved many contacts unforeseen. Among them, Doug Major, owner of the towns limo service offered to take me to and from La Guardia every time I came to New York, all because I gave him a tiny watercolor as a present. The man was totally committed to helping the arts any way he could. He also vowed to find me some buyers. From this first visit was born my constant passion for New York; every time I land there I feel electricity below my feet, as if they moved on their own. I did not sell anything on this visit -maybe because I had nothing to sell, I had only photographs to show. In my haste to get there I had come unprepared for so much potential. So I dedicated myself to walk Manhattan, visiting every gallery in Soho, Greenwhich and everywhere I could. I then returned to Mexico City, very excited, but still without money. I quickly sold what I could at bargain prices and packed five paintings. I convinced Luli to come with me and shortly after I was back in NYC, with my wife and four hundred dollars -nothing, by the city’s standards…yet I had a limousine waiting for us in La Guardia Airport. And so it was that Luli and I became familiar with Manhattan and its museums, with enough coupons to pay for any of the restaurants in the long list of establishments Ed Eglowsky traded with. Some were truly good and we enjoyed much. Our only dilemma was tips we were not included in the coupons… and we were not about to part with the little cash we had, so we avoided going back to the same place to eat again to avoid ugly looks from the waiters. However, we sure slept well every night in very comfortable rooms.